Wheth­er you’re on the hunt for loc­ally craf­ted jew­elry or ar­tis­an­al soaps and lo­tions, Front Street Flea, hos­ted by Front Street Cafe, 1253 N. Front St., of­fers a wide ar­ray of items pro­duced by makers and en­tre­pren­eurs in the River Wards. Great original article by Amanda Staller/Star Newspaper is here. 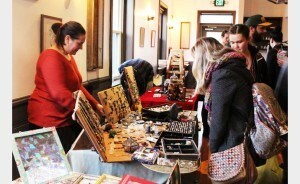 The first of a reg­u­larly sched­uled monthly event took place on Sunday, Jan. 31, pulling in dozens of loc­als in search of hid­den gems. “This is just a beau­ti­ful of­fer­ing to give the com­munity and the artists of the com­munity a place to show their gor­geous­ness,” said Nicole Barclay, own­er of Front Street Cafe. With Barclay’s love of the arts and Front Street Cafe’s vi­brant second floor space, the own­er de­cided the Front Street Flea would be a per­fect event for not just vendors, but the sur­round­ing com­munity to be ex­posed to artists and busi­nesses they may have not yet en­countered. Barclay re­cently began reach­ing out to vendors and word kept spread­ing. The idea of Front Street Flea began to spread among many ar­tis­ans in the River Wards; the event is already booked with vendors for the next six months. Front Street Flea is set to take place the fourth Sunday of every month at Front Street Cafe from 4 to 8 p.m. The big vis­ion for Barclay is to move the event out­side, where vendors and pat­rons could take to the cafe’s out­door garden and bar. “I’m hop­ing that when it warms up, we can double the size of what it is right now and really sup­port the com­munity in that way,” Barclay said. The first Front Street Flea drew in dozens of neigh­bors, with vendors lin­ing the walls of Front Street Cafe. The Tin Goat, a Fishtown-based com­pany pro­du­cing all nat­ur­al soaps and oils, was one of the many busi­nesses that came out to show their products and sup­port the com­munity. “This is fant­ast­ic, ac­tu­ally,” said J.R. Raudabaugh, co-own­er of The Tin Goat. “We’ll be back here again next month. This is an awe­some space. With The Tin Goat up-and-run­ning for just a little over a year now, Raudabaugh is selling his product in sev­en shops in the city. Many of the products pro­duced are made with goat milk, in­clud­ing candles, lo­tion bars and lip balm. Aside from bath and beauty products, many vendors dis­played hand­craf­ted jew­elry. Monk E. Burn­swell, 49, gave neigh­bors a glimpse at the nov­el jew­elry his busi­ness HM Pyro­tech­nics is pro­du­cing. In­stead of full-blown sculp­tures, Burn­swell sold items a little more port­able for those look­ing for their next buy. If you’re look­ing for something even more off the beaten path than goat milk soaps and hand-torched medal­lions, Hedy Sirico, 46, gave cus­tom­ers a look at her take on ter­rari­ums. Neigh­bors young and old came to browse the in­ter­est­ing ar­ray of items, pick­ing up hand-made trinkets as they made their way around the room. Fishtown res­id­ent Liz Palmer, 33, picked up a few items for her­self and dis­covered loc­al busi­nesses that she had not been aware of un­til vis­it­ing Front Street Flea. With a huge amount of pos­it­ive feed­back for the first Front Street Flea, Barclay hopes that the event con­tin­ues to grow and that the com­munity and loc­al artists con­tin­ue to be­ne­fit.